WASHINGTON, D.C., March 15, 2018 — In a jet engine, the flow of air is slowed down to increase the temperature and pressure for combustion — burning fuel with the right ratio of fuel and air to conquer drag allows for acceleration. But in supersonic engines achieving the right flow speed, producing the right ratio of evaporated fuel and causing ignition at the right time is more complex. With evaporating liquid in a combustion chamber, there is more at play than just gravity and drag, especially with supersonic shock waves in the equation. Vortices — the dynamic structures created in a turbulent flow –are affected by the shock wave. This changes the way the fuel combusts and multiplies the number of possibilities of how particles can behave. To deepen our understanding of the dynamics of supersonic flow, researchers look to numerical modeling to calculate the huge variety of possible outcomes in this changed system. In their study, published this week in Physics of Fluids, by AIP Publishing, Zhaoxin Ren, Bing Wang and Longxi Zheng viewed supersonic combustion in a time series through numerical modeling. This allowed them to see how changing variables, such as mass loading fuel, the intensity of the shock wave, and the types of reflecting and transmitted waves created at different points in time will affect ignition. They were able to quantitatively characterize the influence of an incident oblique shock wave on large-scale shearing vortices and exothermal reactions, mathematically mapping the influence of variables and the resulting types of waves created in a shocked gas. Their analysis establishes a reliable simulation method for supersonic combustion using mathematical modeling tools specifically designed for this purpose. 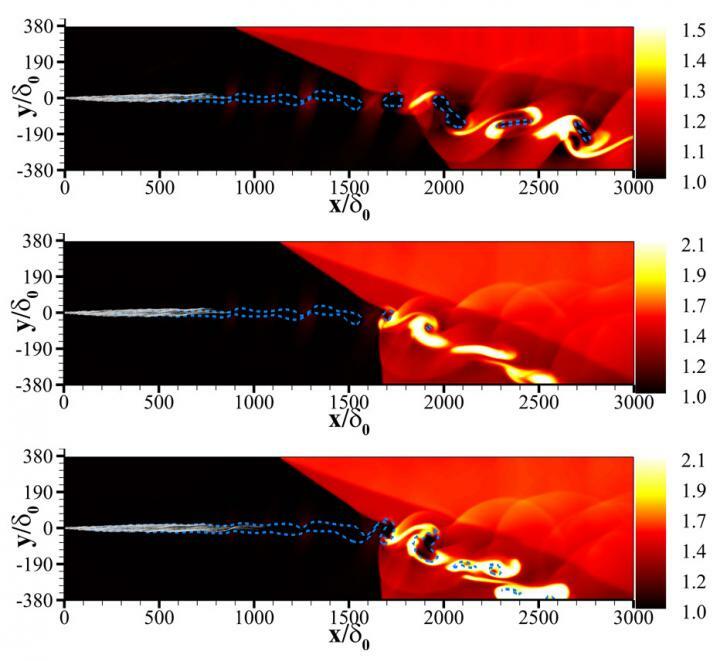 "Currently, no commercial software can simulate the supersonic combustion problem because it requires high-order numerical schemes to compute supersonic flows with complicated evolved shocks, as well as corrected models to describe the droplet dynamics, both of which we carefully consider in our in-house simulation codes," Wang said, a co-author of the study. "Direct numerical simulation can capture the full scales of flows involved in the shock-vortex interaction." Using a combination of custom simulation codes and the Eulerian-Lagrangian method commonly applied to particle-laden two-phase flows, the authors were able to run a broad range of simulations and provide a series of test cases that inform scramjet engine design. Their analysis revealed two induced combustion modes, including a local quasi detonation mode that occurs due to the formation of a refracted wave coupled with the chemical reaction. "The scramjet engine is the most favorable option for high-speed flight at Mach six or more," Wang said. "Understanding the complicated physical mechanism of supersonic combustion and the impact of incident shock waves could help engineers choose the best combination of mixing and combustion through installing movable components in the combustor." The article, "Numerical analysis on interactions of vortex, shock wave and exothermal reaction in a supersonic planar shear layer laden with droplets," is authored by Zhaoxin Ren, Bing Wang and Longxi Zheng. The article appeared in Physics of Fluids March 13, 2018 (DOI: 10.1063/1.5011708) and can be accessed at https://aip.scitation.org/doi/10.1063/1.5011708.